Our day-to-day lives are full of distractions. Being able to multitask effectively is sometimes a requirement and even a badge of honor. It allows people to maximize their productivity and complete herculean efforts under very tight deadlines. And while that might be viewed as a benefit in some roles, it doesn’t always translate into doing things better or even correctly in others. One area where this is traditionally true is in telemarketing. 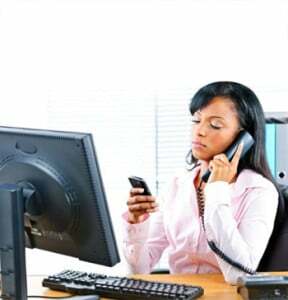 In fact, in most cases, multitasking in regards to telemarketing is a roadblock to success because it reduces the time your call center team spends on the phone. Almost without exception, when clients ask why their internal telemarketing programs are unable to produce the same level of results as our own, the answer is focus. Focus is the key to telemarketing success. Certainly there are other variables that are important such as training, management, promotional offers and database quality, but being singularly focused reaching prospects is essential to achieving success. Proof that this is true is in the math. If you can make 15 calls in an hour, and you spend eight hours on the phone a day, that’s 120 calls a day. Unfortunately for most internal telemarketing teams, they are on the phone for significantly fewer hours in the day for a variety of reasons. This is particularly true for organizations with small internal telemarketing teams who are asked to help out in other ways such as responding to customer inquiries, evaluating opportunities or passing leads off to sales directly. In most cases, the reasons are entirely valid, but it provides the opportunity for telemarketing teams to avoid calling and even seek out other activities that are not their core responsibility. For internal call center teams, this multitasking is nearly unavoidable without a proven process for managing call center time, call volumes and call quality. It also requires superior management and supervision that is often overlooked or too expensive for small internal telemarketing programs to justify. It is this person that maintains the team’s accountability and the necessary focus that is the key to telemarketing success.